“… to strengthen your stakes” Isaiah 54:2. Sunrise 5:31 a.m.; Sunset 9:51 p.m. Being only hours from my daughter’s house, we had a huge decision to make – Do we take a side trip to Valdez? When we left Tok it was a clear morning with sunshine. 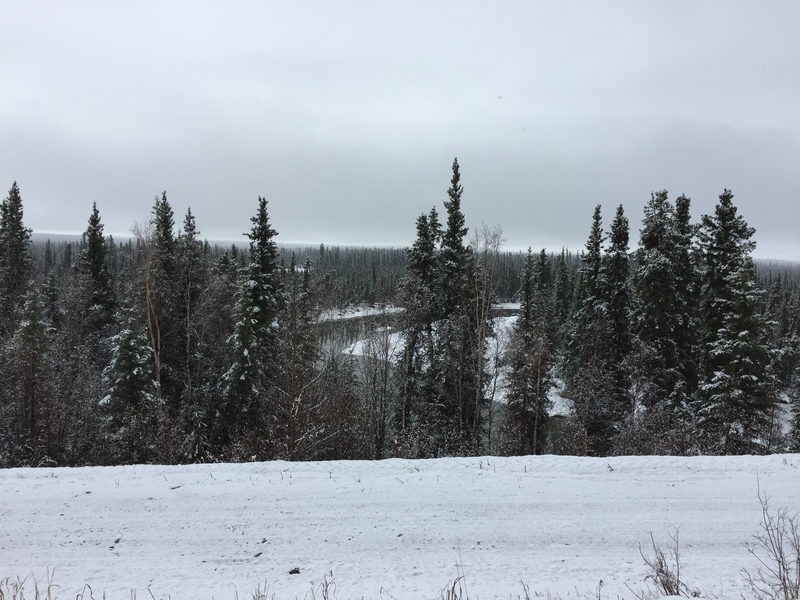 As we progressed along the Tok Cutoff, not only were the frost heaves the worst we had encountered on the Alaska Highway, but the weather deteriorated into rain, frozen mixed and snow. Once we were over the pass, everything cleared up. Though it generally takes two hours to Glennallen, it took us three. 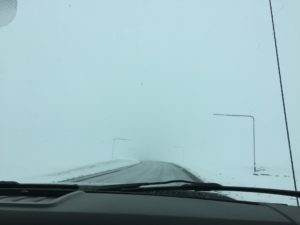 In Glennallen, we asked about the Richardson Highway to Valdez. We had been told the weather was ‘fair’ but passable so we decided to make an adventure of the trip. 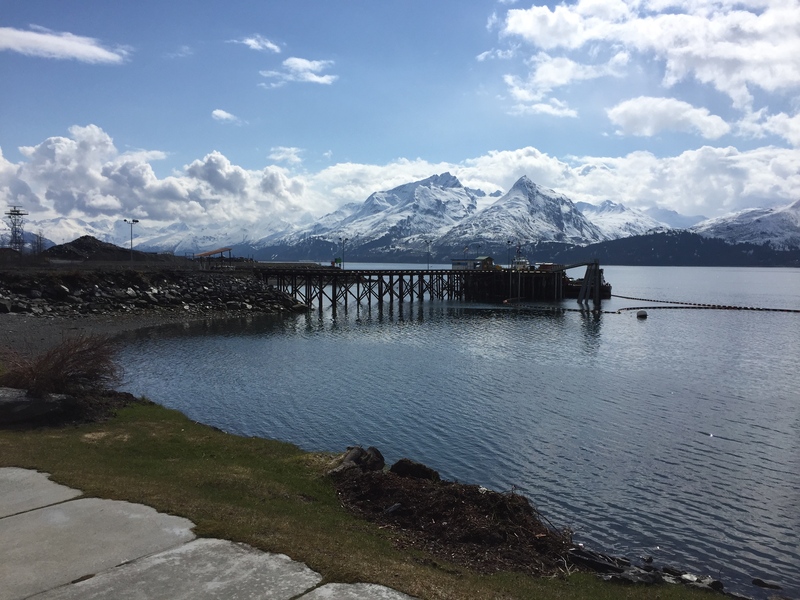 My husband had been to Valdez many years ago, but never to spend some time sight-seeing. 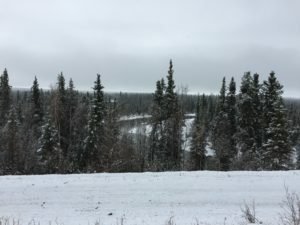 As we traveled the highway, he showed me where he had taken other side trips and hikes and I began to get more of a picture of where he had been when he lived in Anchorage. 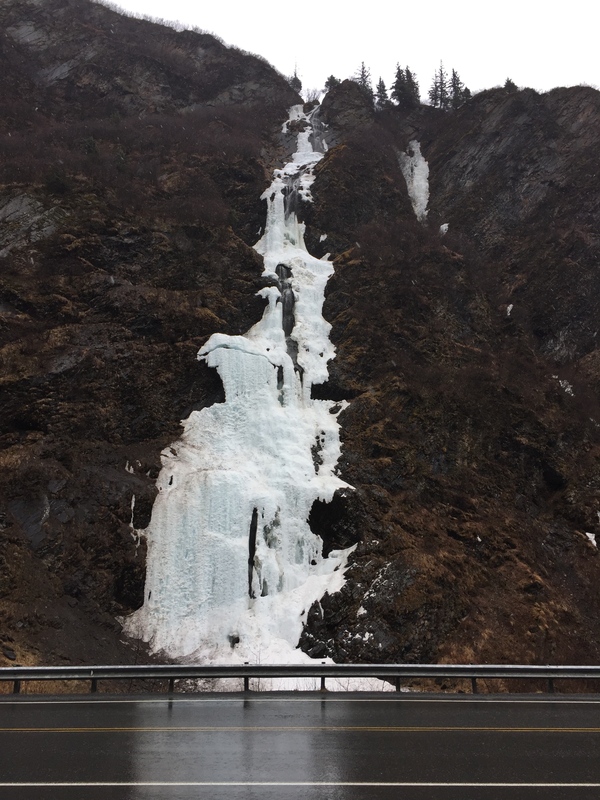 As we approached the Thompson Pass, the rain started and then turned to a freezing mix. 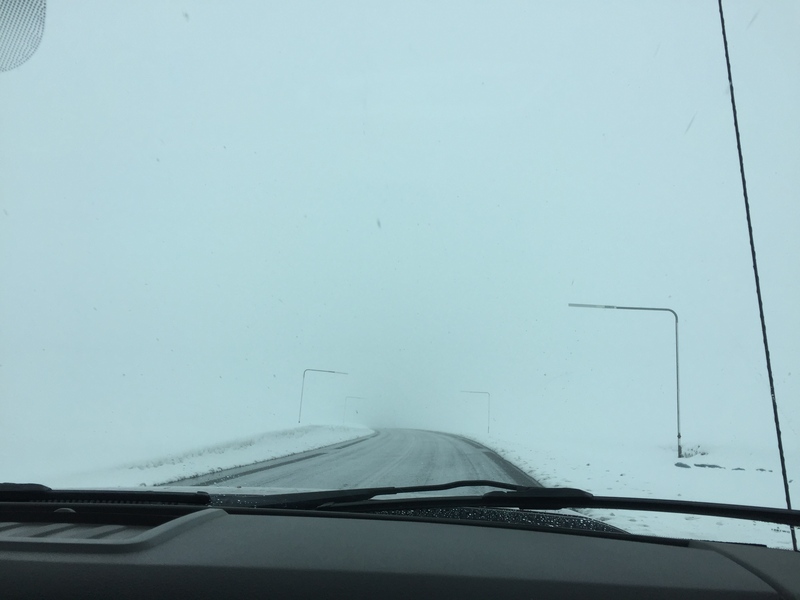 Thompson Pass is known for its irregular weather and sudden changes from dry to wet. Last December the pass received 70 inches of snow in 24 hours. This is not a pass to mess with normally, but we are towing a 14,000 pound trailer! The closer to the top of the pass, the worse the conditions became until we could only see about 25 feet in front of us and yes, it was whiteout conditions. The bars on the sides of theroad are used for snowplows to know where the sides of the road are. Yes, the snow gets that deep! When I called a campground in Valdez to ask about the weather on the pass, I was told that if it was bad to remember that once over the pass, it’s only 20 miles to the town. We took the curves slowly and eventually left the wintery conditions. The rain continued in the canyon. We found our campground, Bayview RV Park, that sits on the edge of the water and an animal protected zone. We were directed to our ‘parking spot’ in the parking lot campground and began to set up in a downpour. My husband hooked up the electric and I turned on our ‘fireplace’. 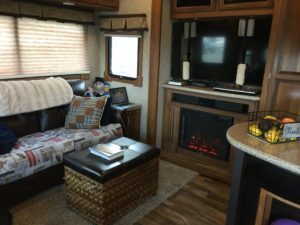 The temps outside were in the 30s and the trailer was about 50. Soon after I smelled something electrical burning. The ‘fireplace’ started acting weird and I couldn’t turn it off. I called my husband and he pulled the fuse. The smell filled the trailer and he went for the owner of the park. Long story short, when some work had been done a few days ago on the electric in the park, a ground wire had disconnected. He asked us to move to another site which we did – after we put everything away and re-hitched the rig. After we were re-set, the furnace didn’t work. We had a problem last year with a board, but this time we knew it had something to do with the electrical issue. 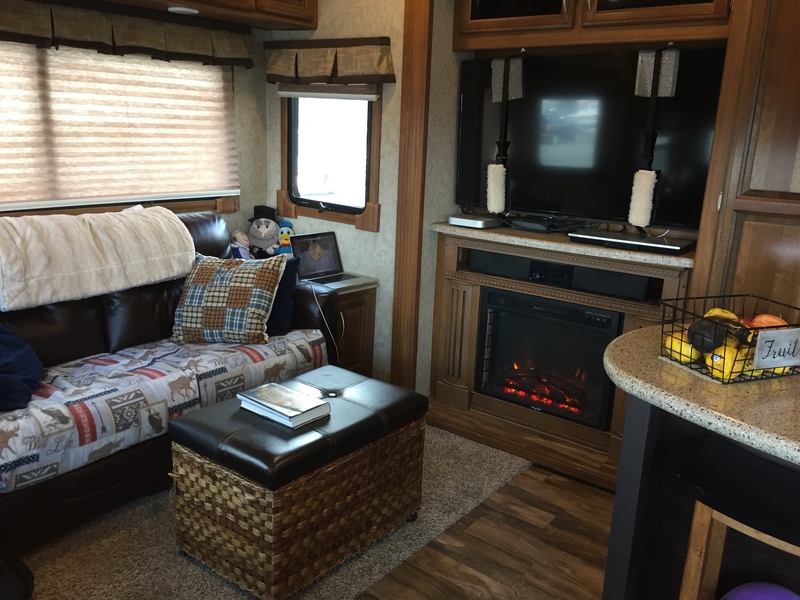 To put it simply, the ‘fireplace’ puts out warmth, but with a nighttime low of 20, we were going to freeze without the furnace coming on and we only set it to 50 degrees! It is necessary to keep the water and other pipes of the trailer from freezing. Our bed is cozy, but as my brother says, “We are heating a tin can!” My husband did some serious trouble-shooting – the manuals only tell you how to install the furnace, not troubleshoot. Eventually, he saw this green button called the ‘wizard mode’ and he reset it. YAY! We had a furnace, but the electrical smell continued to permeate everything throughout the night. Wizard mode … what the heck is that?! In the morning, we were greeted by fog. By this time we weren’t so sure we should have come to Valdez, but when the fog burnt off, well, the rugged majestic mountains around Valdez envelope this little town giving it spectacular views from everywhere all the time. We spent the afternoon by the ferry landing, driving around the boat docks, and visiting the usual ‘touron’ sites. Valdez is known for its many glaciers. I would love to take a cruise and see them along with whales and seals, but I get seasick so that’s not happening. 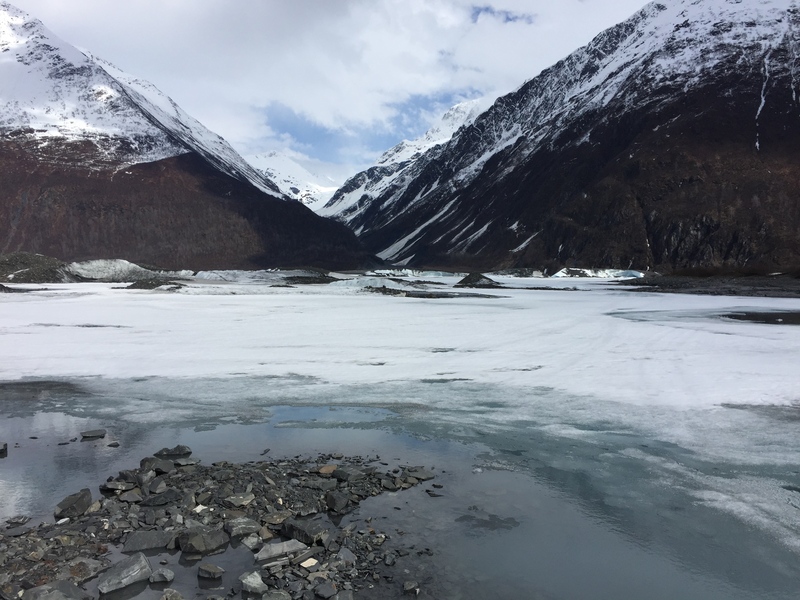 Instead we took a drive to the Valdez Glacier and hiked towards it over the rocks and small streams that flow from it. The two glaciers have receded, but there were small sections that looked like they could calve. We were told by the owners of the park (who returned our two nights payment because of the electrical problems) to return by 5 p.m. as they feed the Bald Eagles. For the past 29 years, the owners have fed the eagles between May 1 and June 15 until the salmon runs start. We didn’t want to miss having eagles fly over our heads – we were even told to move our truck as they would hit it when they dove for their fish. We were not disappointed in the feeding frenzy. From eagles sitting on the ground in front of us to dive-bombing each other into collisions for one fish to watching them catch fish in their claws in mid-air, it was one magnificent life experience having Bald Eagles of all ages soaring over our heads and trailer and landing in front of us to eat fish! 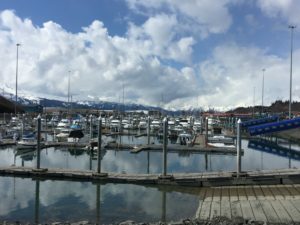 We are now preparing to leave tomorrow for Anchorage and Cooper Landing. Snow is expected on Thompson Pass so we are hoping to leave EARLY before the rain starts here and the snow starts there. And tonight is going to be another cold one at 16 degrees after a nice, warm 47 today! “But those who hope in the Lord will renew their strength. They will soar on wings like eagles; they will run and not grow weary, they will walk and not be faint” (Isaiah 40:31). 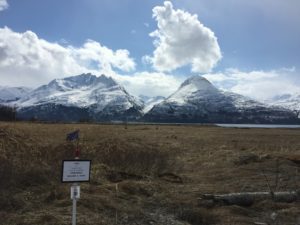 The owners of Bayside RV Park in Valdez are part of a group of people who for the past 29 years feed the Bald Eagles from May 1 – June 15 when the salmon arrive. This has to be one of the coolest experiences of my life. About 30 eagles showed up to catch and fight over the fish being tossed in the air. 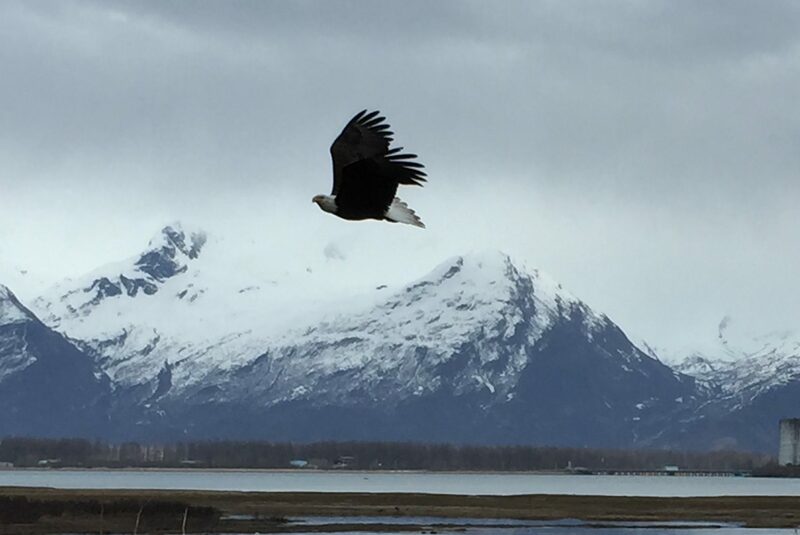 There were four generations of eagles flying about and gave quite the Alaskan show. Enjoy. I took these on my iPhone and NO telephoto; they were just that close. Copyright © 2019 Tentstake Ministries. All Rights Reserved. Powered by Wordpress | Theme Powered by nightlife wordpress themes and provided by qosmio X505-Q887 toshiba for free.